THOSE THINGS THAT ARE HIDDEN was produced in the frame of the TANZFONDS ERBE project PAST FORWARD which includes GERHARD BOHNER, LALI AYGUADÉ, OVERHEAD PROJECT and SIMONE SANDRONI. 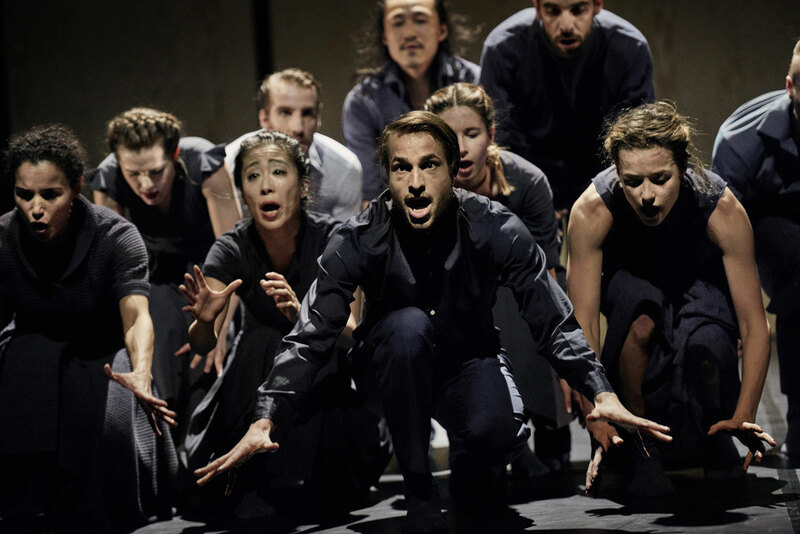 “For past forward, the current production of TANZ Bielefeld, Catalan choreographer Lali Ayguadé, the Cologne-based acrobatics and choreographer duo Overhead Project, and choreographer Simone Sandroni grappled with Gerhard Bohner’s first work, Angst und Geometrie. Three world premieres have been created, which bridge the dance-based past and make visible connecting lines to the different forms of contemporary dance today. Janett Metzger, dramaturge and manager of TANZ Bielefeld, talked to Lali Ayguadé about her play Those Things That Are Hidden. Lali, you called your piece Those Things That Are Hidden. What is it that is hidden? Lali Ayguadé: Gerhard Bohner’s Angst und Geometrie deals with the feeling of fear. This feeling finds its counterpart in formulaic and therefore somewhat restrictive movements, which makes it difficult for us to grasp … The inner life of the characters is difficult to grasp. At this point I asked myself: What happens in the individual figures ? Why are they afraid ? And how do you handle the fear? What Gerhard Bohner hid behind the form or, as he calls it, the geometry, is what I wanted to turn outward in my piece. What kind of interaction do the characters find with their fear? In my piece, the dancers are constantly searching for something – something that gives them stability and stability in the stage of the uncertainty they experience. Central to this is the community or different forms of community. The choreography is permeated with ritual and beliefs. Frequently, as in Angst und Geometrie, there are also sequences of steps that are based on traditional dances. The references to folklore have particularly inspired Gerhard Bohner’s play.